Danny Melnick has produce over 100 music festivals in Europe, Japan and the US and has worked with contemporary legends like James Taylor, Paul Simon, Bobby McFerrin, Dianne Reeves, Ravi Coltrane, Bela Fleck, Chaka Khan, Diana Krall, Wynton Marsalis, and more. He founded his own company, Absolutely Live Entertainment, LLC, in 2007, and has traveled to over 30 countries producing extraordinary entertainment events. At the Saratoga Performing Arts Center, he will produce the Summer of 2018’s 41st Anniversary of the Freihofer's Saratoga Jazz Festival. Following in the tradition of iconic concert and festival producer George Wein, Danny Melnick has distinguished himself as a force in the music concert field. Stay Thirsty Magazine was pleased to visit with him at his home in Saugerties, New York, for this Conversation. STAY THIRSTY: This June, Freihofer's Saratoga Jazz Festival will celebrate its 41st Anniversary at the Saratoga Performing Arts Center (SPAC). Why does this festival have such staying power and why does jazz continue to transcend generations and draw such loyal audiences? STAY THIRSTY: You have a long and storied career as a concert promoter and producer who has organized festivals, concerts and performances involving some of the greatest musicians of our day. How easy or difficult has it been to deal with major talents and their particular needs? DANNY MELNICK: It all depends on the artists and their “people.” I’ve had the most wonderful, friendly and “human” experiences with the biggest stars and then sometimes you just want to run away as fast as possible and wish you never met them. BB King, Dave Brubeck, Dizzy Gillespie, Norah Jones, Tony Bennett, James Taylor – all gems. The nicest people you’d ever want to meet. And they all had a great team around them. We’ll leave the troublemakers for the guessing game. STAY THIRSTY: What it is about the Saratoga Performing Arts Center that keeps you and your audiences coming back? How is the Saratoga Jazz Festival different from the others you produced and how do the venues differ from a production point of view? DANNY MELNICK: Every festival is unique to itself based on the venue, marketplace, surroundings, etc. SPAC is an incredible amphitheater in a beautiful park setting with a second stage, bar area, crafts tent and food court. So we tailor the festival to that environment. Other festivals take place in urban city centers, or indoors at clubs and concert halls. And SPAC is such a fantastic place in terms of production because almost everything is there – stage, dressing rooms, seating, box office and huge parking lots. I’ve worked on many festivals where it all has to be brought in and that takes a ton of money, time and labor. STAY THIRSTY: How important are major milestones in time or in career, like the 50th Anniversary of Miles Davis’ Kind of Blue album or the Sonny Rollins 80th Birthday Concert or the 60th Anniversary of the Newport Jazz Festival, in how you conceive and build a program to produce? DANNY MELNICK: The importance of these milestones is really determined by the audience and marketplace. They do give producers like me an opportunity to celebrate recordings, events and artists and to expand the audience for this music but sometimes they don’t have a lot of meaning to a larger audience and simply don’t work. I have tried to choose wisely when either being asked to produce projects like these or when I’ve created them myself. And I work hard to develop the most compelling projects possible, always striving to offer the artists a platform by which they can best present themselves and their music. STAY THIRSTY: What convinces you to do charity fundraising concerts like JusticeAid that celebrated Bob Dylan’s 76th birthday? Are certain charity concerts more likely to succeed than others? DANNY MELNICK: I met the head of JusticeAid, the Honorable Stephen Milliken, a few years ago and instantly knew his vision and determination to make the organization meaningful was real. He has a great board, supportive donors and strong ideas about how to present the events and that allows someone like me to comfortably and confidently ask the artists to participate and produce successful concerts. I have been contacted by many organizations who have “pie in the sky” ideas with no “community” of support behind them to begin with and that’s always a red flag for me. It can be very risky business and you typically get only one chance to get it right when you’re fundraising. 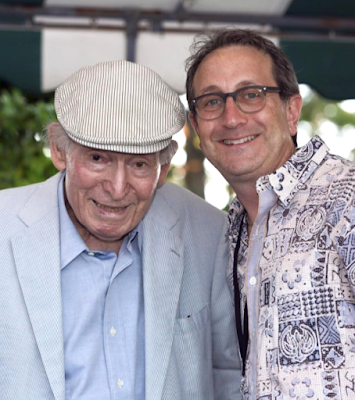 STAY THIRSTY: How did you come to work with the legendary producer George Wein and what did you learn from him? DANNY MELNICK: I worked at the Blue Note Jazz Club in NYC from Aug 1989-April 1990. Towards the end of my time there I learned about George and his company, Festival Productions, Inc. and had to work there. I mailed a letter and my extremely light resume to him, followed up with a call, and wound-up speaking with his assistant Deborah Ross. She was overseeing the hiring of the JVC NY Jazz Festival box office manager position, which was a seasonal job managing the ticketing for the festival that June. I had gotten box office experience during a college internship at Wembley Stadium and Arena in London and that, along with a good interview I suppose, convinced Deborah to hire me. I was supposed to be there for three months and stayed for seven years. I went back two years later for another eight years and then again, but that’s another story. George is the Jedi Master. He has done and seen it all…survived multiple decades of economic and cultural changes, new ways of doing business, new artists, competition and continues to look only towards the future. He is 92 now and while I’ve learned many things from him…focus on tomorrow is probably to most poignant and valuable thing I can point to. STAY THIRSTY: How did the development of computers and the internet change the concert production business and how heavily do you rely on advanced technology in your daily endeavors? What role does digital media play in how you strategize and promote a production? DANNY MELNICK: Of course the internet and technology have radically affected everything we do but the number one issue for promoters and producers is marketing. It used to be that we could take out an ad in, say, the Sunday New York Times and sell $50,000 worth of tickets in a day. Now it’s all about posting online, hoping the audience sees what you’re doing, shares it, acts on it, etc. It’s cheaper but definitely less focused and that’s been a big challenge. It doesn’t matter much if you’re promoting mass popular culture artists or events, but when you’re dealing with a more micro-focused audience, it’s strange not to really know how your audience is getting their information. STAY THIRSTY: If you could produce the single greatest show of the twenty-first century, what would the theme be, who would you bring together and where would it play? DANNY MELNICK: Music is the ultimate connector. There’s nothing like it. I suppose the dream would be to have tens of thousands of artists all over the world performing at the same time (which they do already, right?) and allow that vibration to permeate every human being. To wake people up to realize we are all here together and are either going to make it together or going to go down in flames. It’s ridiculous how ignorant people are to that reality and I honestly believe music is part of the solution. STAY THIRSTY: What is it about live performance that continues to attract audiences? DANNY MELNICK: Just as I said before, music is the great connector. People who come to the events my colleagues and I produce are from all walks of life and see and hear artists from all walks of life. The bands are as diverse as they come and so are the audiences. It’s such a powerful life experience to be at a concert or festival and I actually feel bad for people who chose not to or don’t get the chance to experience live art.